Do it the Spanish way and start your afternoon tea with a helping of the refreshing Cucumber and Watermelon Gazpacho. Texturised with our favourite cooling fruits, the gazpacho helps cool us down and preps us for a wondrous afternoon ahead. We shall move on to savoury sandwiches and pave our way through the indulgent afternoon. The Quail Egg and Avocado Sandwich may be simple, but it is nothing short of satisfying; something that reminds us of home, we’d say. Because egg mayo sandwich is so yesterday, we now enjoy our Egg Mayonnaise in a cute little sesame cone! It is those cannot-stop-popping kind of snack, and this item adds a varied texture to the cakes and breads. Sure, it is not common to be served Italian Braised Beef Meat Balls as an afternoon tea snack. But this is precisely what we love about Fresh Fruits Lab’s rendition – the team is ever innovative in their creations, yet always tug our heartstrings in the simplest ways. Our favourite savoury item of them all! This Crispy Prawn Pop was so addictive, we were so tempted to order an ala carte portion of it! Essentially fried prawn pieces, this flavourful snack is doused in a kickass Thai sweet chilli sauce. Rainbows are never too outdated. We remember many of you love Fresh Fruits Lab’s homemade Rainbow Cake, and so, the team included a slice of their famed beauty in their afternoon tea set. Go ahead, snap more photos! What is afternoon tea without some macarons? Presented as “lollipops”, the chocolate and lemon macarons of the tea set will send you to heaven. Too pretty to be eaten! The Orange Sable with Chocolate Cremux & Strawberry sits comfortably in a test tube when served; just imagine the amount of meticulous work that goes into piping the chocolate and placing it into the tube without crushing it! And of course, it tastes better than it looks. Profiteroles? Yes, please! Good choux pastry balls are scarce in town, but we were really pleased to see them included in the tea set. And the cherry on top? Actually, mango. These homemade profiteroles are filled with mango cream! A Tiramisu with Mascarpone Cream with Mocha and Toffee Sauce, Strawberry and Phyllo Chip served on a tripod and gauze mat - this is one helluva complicated tiramisu! A delectable twist to the traditional version, this inclusion makes the afternoon tea set so worth it. Every diner is entitled to a choice of drink – classic teas, coffee or Fresh Fruits Lab’s signature cold-pressed juices. Of course, everyone gets a complimentary palate cleanser too. See those cute colourful tubes of juices? 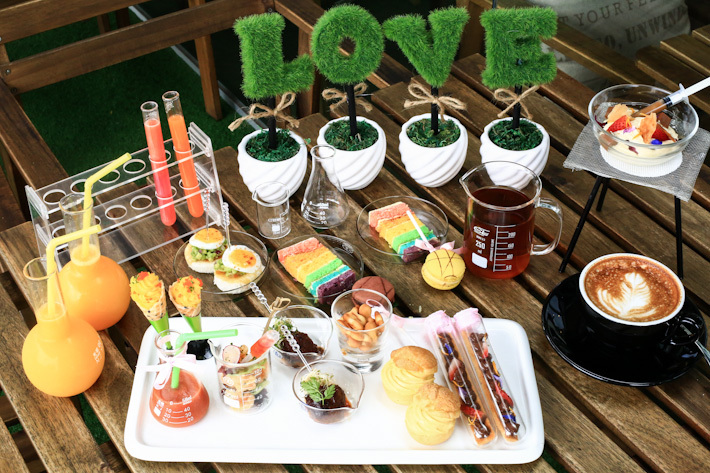 Fresh Fruit Lab’s laboratory-themed afternoon tea (S$19/pax, minimum 2 to order) is available on Tuesdays to Fridays from 3pm – 5pm. Reservations are highly recommended. This post is brought to you by Fresh Fruits Lab.